Want to get lowdown on everything emoji? Well, the good people at NeoMam Studios have created a wonderful info-graph and guide on everything emoji. From the history to the stats, they’ve got it covered. We’ve gone ahead an transcribed everything you need to know below. You can also find the beautiful visual graph at the bottom. A picture is worth a thousand words – maybe that’s why emojis are the go-to way to communicate when we’re messaging each other. But what exactly are they, where did they come from and why do people love them? Emoji means picture character in Japanese. Emojis are small images used for communicating via text messaging and social media. They’re quick, colorful and can lighten the mood. 1995: Japanese telecom company Docomo adds a heart symbol to its Pocket Bell pager device, a popular precursor to text messaging in Japan. 1998: Shigetaka Kurita of Docomo invents emoji to add mood and emotion to digital conversation. 1999: i-mode, Docomo’s integrated mobile internet service that features 176 12x12px emojis, launches in Japan. 2000’s: Custom and unofficial emojis become available on various platforms. 2004: i-mode grows to 40 million subscribers, giving emojis a huge audience. 2010: Emoji is added adapted into Unicode, the computer industry standard for writing and characters. 2011: Emojis go global with Apple’s iOS 5 software update. 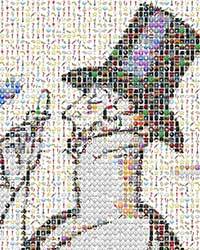 2012: The New Yorker releases a cover made up entirely of emojis. 2013: The word ’emoji’ is added to the Oxford English Dictionary. 2014: Unicode 7.0 adds 250 emojis as standard, which will be included in future iOS and Android updates. We remember more of what we see than what we hear. So it’s no wonder these little ‘picture characters’ have taken off. Emojis are easier to understand: Average attention span dropped from 12 seconds(2000) to 8 seconds (2013). Emojis are more convincing: People are 43% more persuasive when using visual aids. Emojis help us communicate emotion and tone – something difficult to convey in text. But the appeal of emojis could also be in their indefinite meanings. You can say something without explicitly saying it. It’s like body language for text messaging. The ability to visually read a situation at a glance deteriorates the older we get. Perhaps that’s why emojis are more popular with young people. 50% of 18-29-year-olds have used emojis. Nevertheless, 55% of people say the main reason they use emojis is because they’re cute. Emojis: are we devaluing the way we communicate, or expanding it with creativity? What do you think?